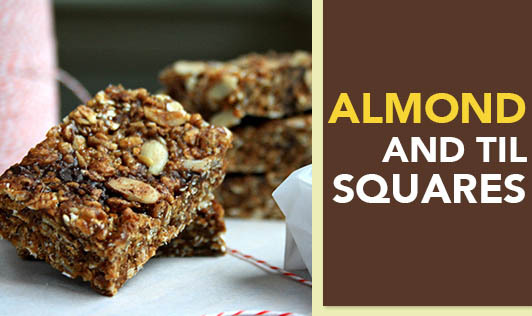 Here is a healthy sweet treat made from sesame seeds and almonds for you and your kids! These ingredients are rich in iron and folate, so they can make a perfect nutritious snack too! 1. Roast the sesame seeds for a few minutes over a medium flame till they are light golden in colour. Cool and keep aside. Repeat with the almonds. 2. Grease the back of a flat thali or a stone surface with a little ghee and keep aside. 3. Heat the ghee in a pan and add the jaggery to it. Simmer over a slow flame till the jaggery melts and caramelizes and forms a hard ball when you add a drop in cold water. Remove from the flame. 4. Add the roasted sesame seeds and almonds and mix thoroughly with the melted jaggery. You may need to put off the flame during this process. 5. When the mixture is ready, pour the entire mixture over the greased thali or a smooth stone surface. Roll the chikki out into thin sheets using a greased rolling pin. 6. When cool, cut into squares. Store in an air-tight container.